As we gather 'round a mound of fried peanut butter and banana sandwiches, Royal Crown Pomade, sequins, and Col. Tom Parker voodoo dolls in honor of Elvis' 80th birthday, now's the perfect moment to revisit the most enduring conspiracy theory that (hound) dogs the King's legacy. You know it: ELVIS IS ALIVE! The no-longer-in-print Weekly World News — without which supermarket check-out lines are a dull place, though the (satirical, duh) paper is still published online — enjoyed an extended pop-culture moment with its "Alive" coverage. This theory, of course, assumes that the Big E faked his 1977 death, and it shows no sign of abating. 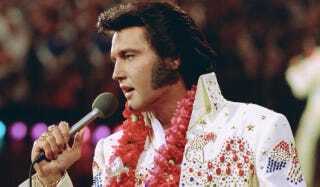 According to a 2012 WWN article entitled "Elvis' Tomb is Empty" (note: it quotes a "famed seer" who "conducted a psychic investigation of Presley's alleged burial site" as its main source), he took such a drastic step because "superstardom made his life a living hell." After his "death," depending on who you ask (or what issue of the WWN you're reading), he's either been enjoying a quiet life out of the spotlight (possibly in the vicinity of Kalamazoo, Michigan, though he was spotted enough places to spawn a best-seller and a pair of documentaries), or he died in a 1989 Bolivian plane crash ... a theory even the WWN admitted it couldn't fake-prove. One issue with this evidence is that Elvis isn't buried in a tomb at all; he hasn't been since October 1977, when his body was moved to Graceland due to security concerns. OR WAS IT? Conspirators point to the discrepancy between the spelling of his middle name ("Aron" vs. "Aaron") between the King's birth certificate and gravestone. Reasons given for this include that the birth certificate was misspelled ... or that Elvis himself added the extra "a" later in life for personal reasons. Though the fervent belief that Elvis is still among us (has any other superstar inspired such fervent hopes?) remains, even in tongue-in-cheek form, there is another possibility out there. Perhaps he switched places with an impersonator, who actually died in his place in 1977, and ended up at a nursing home ... where he and a cleverly disguised JFK joined forces to defeat a cursed mummy. Ahem. Top image via Record Collector News.